The Kerrie Show: Would You Make Your Kid Ride A Bike For 60 Minutes? Would You Make Your Kid Ride A Bike For 60 Minutes? Childhood is full of so much hyperactive wonder. Mudpies and butterflies, as my grandmother used to say. Today's urbanized world forces us to pay closer attention to making sure our children get enough exercise. These poor kids spend so much time at school, and we as parents spend so much time at work, that is difficult to make sure they get enough play time in the few daylight hours remaining. As a result, we must become very intentional about keeping them engaged in activities. Most parents are right about this. They enroll their children in a variety of sports. Everything from soccer to baseball, and sometimes they get them enrolled in multiple sports at once. This has the frustrating side effect of piling even more events into the parent's busy day. But, for the family who prioritizes an active lifestyle, a busy night of practices is about the only option. 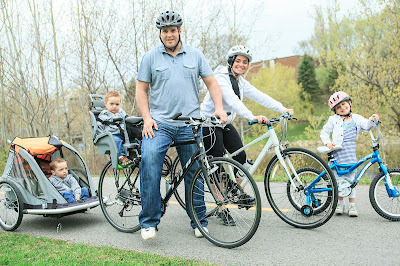 Cycling is quickly becoming a favorite family past time for families across America. It's a sport that almost all of us grew up doing. And, as the adage is "You don't forget how to ride a bike." If you are a savvy shopper, you can find cheap bikes for the whole family online stores, like DavesCheapBikes.com. Include them in the bike-shopping process. As a kid, there is almost nothing more exciting than getting your very own bicycle. Add in a bike trailer and some bikes for the older kids, and suddenly you have sport the entire family can readily engage in. Miles of biking trails cross almost every urban city and they offer an extremely safe environment for the entire family to go riding. Suddenly, getting your kid enough activity becomes a matter of nothing more than putting helmets on and sending them out to pedal around. If you want to increase the challenge for them, you can get on your bike and take them on a longer ride. Many families make it a nightly activity. 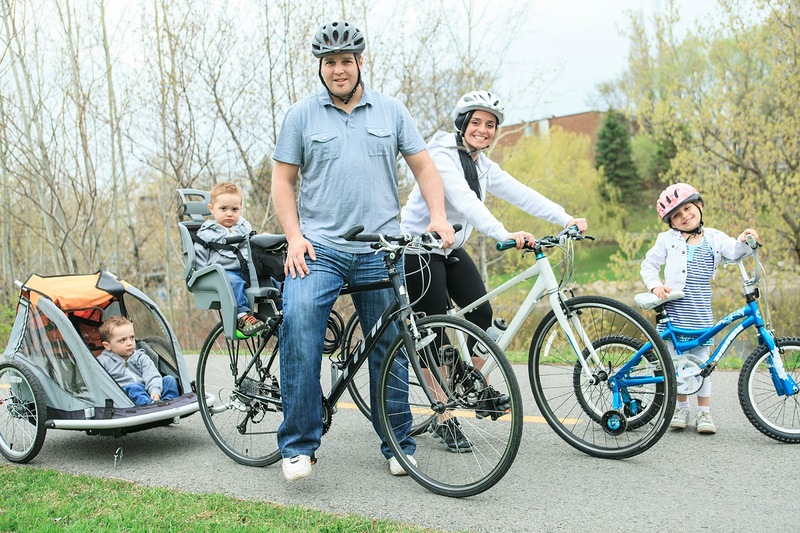 In some cases, if you are near the bike trail, you can load the bikes up in the car and drive to the nearest trail for a fun evening of pedaling. For the weekend, longer bike rides can be a real treat. Pack a lunch and start in the morning when it is cool. Wrap up the day with a picnic at the park. How Much Exercise Is Recommended For Children? The CDC is considered the authority on this. They recommend sixty minutes of cardiovascular activity for your kids every day. An hour a day of bike riding might seem like quite a bit. However, considering the rate of Childhood obesity in the world today, it makes a lot of sense. Only fifty years ago, televisions were much less, and children spent the bulk of their day outside. In light of that, an hour of activity makes sense as a bare minimum. But we have to be smart about it. Especially if we are increasing our kid's activity level. How Much Exercise is Too Much For Kids? When we adults think of exercise, we think of "going for a run" or engaging in some other high-intensity activity for a set rate of time. Adults are good at pacing themselves. Kids haven't fully developed those skillsets yet. They naturally want to go in sprints. Run hard, rest. Bike hard, rest. Play hard, rest. These micro-exercising moments are natural and help the child find their pace and their balance. It is essential to encourage your kids to keep playing and keep staying active. However, do so with these "micro-bursts" in mind. You might get them to pedal to "the stop sign." And then you take a little break before you pedal "to the white mailbox." As they get older, the amount of exercise that they complete between their moments of rest should also increase. So you might have them go one lap around the block. And then two laps. Pretty soon you have a kid who is doing multiple laps around the block, and it becomes essential to make sure they are listening to their body and staying safe. Just as with adults, it is easy to push kids too hard when they first begin exercising. They have to learn their limits. Even more importantly, they need to master balance and self-awareness. With children spending so much of their lives forced into a sedentary lifestyle, our children have lost the normal awareness of themselves. This lack of motor finesse puts the kids at risk for injuries. Trip and falls, sprains and broken bones are risks that kids face, anyhow. However, when you take a child that has spent most of their life in low-risk activities and then move them up to normal-risk activities, you have to be careful not to overdrive them. Tiredness also pushes the risk of injury. So increase your kids' exposure to sport at a slow and steady rate. Hydration is also critical. Heat stroke is a genuine threat and often children have not learned to listen to the warning signs of thirst and hunger. It may be a little over-kill, but make a game out of drinking fluids while they exercise. Each child should have a readily available source of water and should be encouraged to drink even when they are not thirsty. Over time, they will develop a healthy sense of thirst, but it often takes a little while before that sense is fully developed. Meanwhile, your proactive technique will keep them safe and build the habit of drinking plenty of fluids. Whether it is cycling or soccer, keeping your kid active is one of the most significant challenges you will face as a parent. It also provides the opportunity to create some of the most rewarding memories.